Xin Zhang received the M. T. Thomas Award for Outstanding Postdoctoral Achievement. He is a geochemistry postdoctoral research associate at Pacific Northwest National Laboratory and a member of the Interfacial Dynamics in Radioactive Environments and Materials (IDREAM) Energy Frontier Research Center. 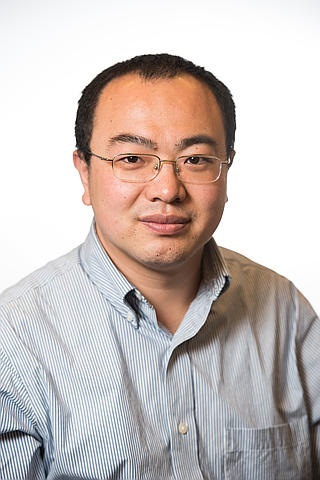 EMSL's User Executive Committee, chaired by Lou Sherman, Purdue University, selected Zhang because of his outstanding creativity and productivity. He is an accomplished scientist who has used EMSL expertise and capabilities to make significant contributions on projects relevant to EMSL's mission. His research at EMSL has led to several new discoveries and technological innovations in geochemistry and material science. PNNL Associate Director and IDREAM Research Thrust lead Kevin Rosso nominated Zhang for this year's award. "Xin is exactly the kind of candidate that this award seeks to recognize," said Rosso. "He is a self-driven and highly productive scientific leader and innovator." Zhang has an excellent reputation in surface science, crystal growth, materials synthesis and characterization. His research interests include probing particle-mediated growth with a predictive understanding of self-assembly for energy applications and real-time imaging of mineral carbonation in supercritical carbon dioxide using high-pressure scanning probe microscopy. Working at EMSL, Zhang has co-authored 23 papers in peer-reviewed journals (17 published and six in review). He was lead author of 2017 papers in Science and Nature Communications, a 2018 paper in Nature Protocols, and 2017 and 2018 papers in Crystal Growth and Design. By invitation, he co-authored the book chapter, "Advances and Future of White LED Phosphors for Solid-State Lighting" in the 2016 book Advanced Magnetic and Optical Materials. He is on the editorial board of the journal Advanced Composites and Hybrid Materials, and he served as guest editor of three special issues in the Journal of Nanomaterials and one focus issue in the Journal of Material Research. As an EMSL user, Zhang has made nine presentations at seven conferences, including an invited oral presentation at the First International Young Scholars Geo-Symposium at Perking University, China. Zhang came to PNNL in 2014 as a postdoctoral research associate. He holds a doctorate in chemical engineering from Texas Tech University. His master's in organic chemistry and bachelor's in chemistry are both from Shanxi University, China. EMSL presented the first M. T. Thomas Award in 1996 in honor of Dr. M. Tom Thomas, who joined the EMSL project team in 1987 and served in various leadership capacities as the project progressed from conceptualization to realization. Thomas served as the EMSL project manager from 1989 to 1991, and was the EMSL operations manager before retiring in 1995. The award acknowledges outstanding accomplishments by postdoctoral fellows who conduct their research at EMSL.